I’ve read a few of Joe Donnelly’s books. Most of them are set in Scotland, but The Shee is a little different. Although the central character is a Scotsman, the story is set in Ireland and is based on the Morrigan of Celtic mythology. Donnelly gives the impression of being quite knowledgeable on the subject and he does a good job of working that knowledge into the story. 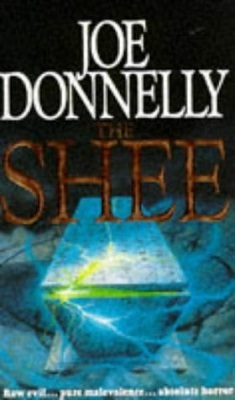 But I must admit, I didn’t enjoy The Shee as much as Donnelly’s other books. The book is 520 pages long and the story just seemed to drag on forever. I’ve read longer books than this without any problems, but I think this one could do with losing a couple of hundred pages. Many of the descriptive passages and history lessons take away more than they give. If I had to compare reading The Shee to going on a long bus journey, I would say that once I’d bought my ticket I felt obligated to see the journey through to the end. I wasn’t sticking my head out of the window to be sick (it wasn’t that bad), but like a child, I kept on wondering are we nearly there yet? No such luck. The man in the driver’s seat (Donnelly) had decided on the scenic route, but I had lost interest in the view and was ready to pack my bags and run at about page 200. There are a lot of characters to keep track of in The Shee, but the main one is a photographer called Sean McCullain. Sean has come over from Scotland on an assignment with a journalist called Liz Cannon. Liz has a certain amount of talent but she is young and has a lot to learn; so it isn’t long before sparks are flying between her and the seasoned veteran, McCullain. About a quarter of the way into the book though, all those sparks generate a little heat and a chemistry develops between Sean and Liz that helps to make them seem a little more real and interesting. The story is set in the fictional, small town of Kilgallan where the rural community has been temporarily expanded by an influx of summer visitors. Sean and Liz rent a holiday cottage for the duration of their stay and their immediate neighbours include the Ducains, a young American couple who are on honeymoon; a party of three oil-rig workers who are taking their leave in Kilgallan and doing a spot of fishing; two members of the IRA; and a couple of Special Branch agents—who are pretending to be bird watchers, but are really watching the two terrorist in the cottage opposite. There is also a team of archaeologists in town. They play a very important part in the story. Dr Connarty and his team are excavating an old tor and Connarty has high hopes that when they reach the burial chamber they will discover that it’s a major tomb. Unfortunately for all concerned the chamber contains neither king nor queen but is, in fact, a prison designed to hold the Shee for all eternity. By the time anyone realizes this, it is much too late, the Shee is free. As I mentioned earlier, there are a lot of characters in The Shee; not too many of them survive until the end of the book though. The Shee is extremely proficient when it comes to providing them with extremely macabre and gruesome deaths. Children are murdered in this book as well—so be aware of this if it is likely to upset or offend—and an old lady is sexually abused by a cadaver that drips putrescence all over her screaming face. One farmer has a deadly encounter with some huge toads and something extremely nasty makes a meal of one of the fishermen. The Shee contains some shocking and very imaginative death scenes that will not go down well with the faint-hearted. I have a strong stomach and none of the really nasty stuff bothered me too much. The fact that the story dragged on for so long did bother me and from time to time I found my attention wandering. On a scale of one to ten, I think I would only give The Shee a five or a six. It is not the best book that I have ever read, nor is it the worst, but now it is back on the shelf it will probably only come back down for dusting.